Before John Dos Passos enjoys fame as a chronicler and critic of American society, he wins recognition for command of aesthetics. 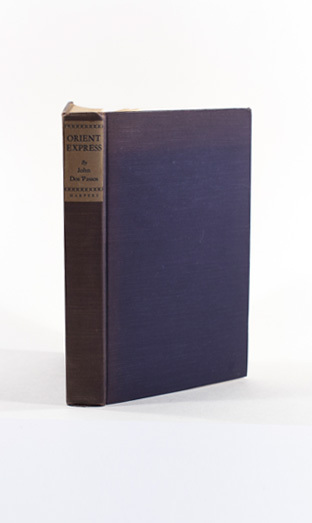 Orient Express, a memoir of the author’s travels through Eastern Europe, the near East, and the Middle East, focuses on sights, sounds, and smells rather than plot or character. Dos Passos applies his instincts as a painter to mountain ranges and grimy alleyways, finding beauty everywhere. His tour extends from Tiflis, Georgia to Erivan, Armenia and Marrakesh, Morocco; from Kasvin, Iran to Baghdad, Iraq and Damascus, Syria. He crosses the Syrian Desert, observes the aftermath of the Greek-Turkish War, climbs the Caucasus, explores Persia during the rise of Reza Kahn, and records the creation of Iraq by the British. His message is clear and relevant to contemporary travelers: holiness and happiness abounds in the East as much as the West.